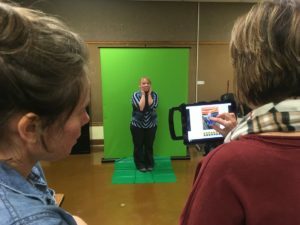 In today’s mobile filmmaking, content creator atmosphere, it can be quite a challenge if you have to use a green screen. How do you do that when you’re move from location to location? You can’t always be in a studio after all. That’s where the Valera Explorer 90 and Creator series green screens can come in handy. 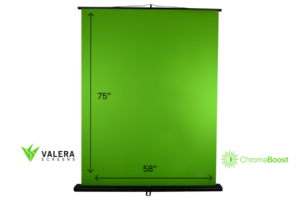 I first saw the Valera Creator Green Screen at CES, and was instantly intrigued by the design, as it reminded me of the pull down movie screens we had in our school classrooms, only instead of being mounted on the wall, where you would pull them down, they are placed on the floor and you pull the retractable green screen up. The benefits of this design for chromakey are pretty clear. 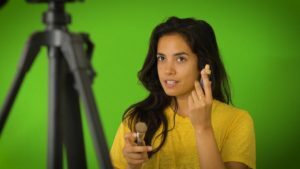 First, there’s no wrinkling that can come from a green screen itself, and you don’t have to devote a wall to be painted with chromakey paint. The idea here is that the green screens are portable, and can maintain a tight backdrop from edge to edge, without the need to worry about any kinks or wrinkles, which would require bringing additional gear like a frame and clamps to tighten the backdrop. The Creator 95 is 75″ tall, by 58″ wide, and can be set-up in less than 10 seconds. You carry it with a portable handle, place it down on the floor where you plan to record, pull out the stabilizing fins and then pull up on the screen to it’s full height, along with aa supporting rod that will keep the Creator 95 deployed. The spring tension keeps the green screen tight from top to bottom, and the movie screen style wrinkle resistant fabric is painted with Valera’s Chromeboost green screen color. Proprietary ChromaBoost™ wrinkle resistant fabric enhances your green screen’s chroma key performance in low light. In spite of its 11.5 pound weight, I found the Creator 95 to be ideal for the mobile filmmaker who needs to chromakey from wherever they are, and the setup is incredibly easy to deploy and light. The only thing I found a bit odd, is that even though it’s designed to be mobile centric, it doesn’t have a carrying case. Since it has a handle, it’s not really needed, but a carrying case would make it easier to sling over your shoulder, and would protect the green screen when traveling or while in storage. By contrast, since it has multiple parts, the Explorer 90, has a carrying case, even thought it isn’t as portable. But the Creator 95 is well built, as you can imagine with it’s 11.5 pound girth, and is clearly designed to be carried around. It’s robust, easy to setup, and would make a valuable addition to your filmmaking kit, especially if you’re doing reports on location, talking head videos, or anywhere else you need a green screen to shoot from the knees up. Still, in spite of these nitpicks, I found the Valera Creator 95 is robust and solid in construction, a good option as for portable green screens that can be deployed on the fly. 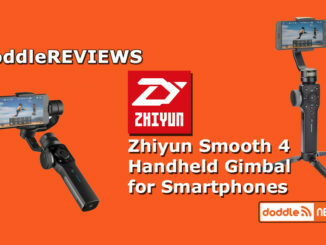 It’s robust, easy and quickly to setup, and would make a valuable addition to your filmmaking kit. Ideal for doing reports on location, talking head videos, or anywhere else you need a green screen to shoot from the knees up. 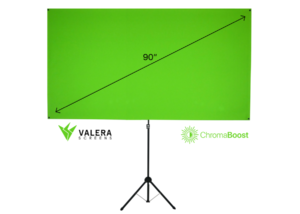 All you need is a few portable LED lights to round out the your kit, though Valera’s Chromaboost design promises enhanced chromakey performance, even in low light. 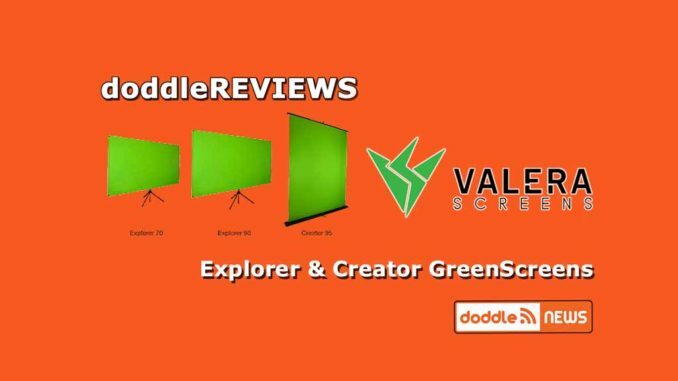 Price of the Valera Creator 95 green screen is $149. Valera also offers a 10% discount code for students and teachers through their K12 Unleashing Classrooms Program. But you can get a 15% discount right now by using the coupon code “DODDLE15.” The code expires May 25. The next version is the Valera Explorer 90. This 90″ screen is 16:9, so you can use it for two shots, but because it is designed to be deployed on a light stand device, it will likely be used to chromakey from the waist up. 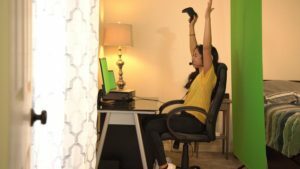 Moreover, you can also lower it down closer to the ground, which makes it ideal to chromakey out your background if you’re recording from behind a desk or table, or creating let’s play gaming videos and want to be included in the video image, along with the game footage itself. The Explorer 90 has a diagonal dimension of 90″, and comes with a lightweight green screen tripod that has an X shaped arms which you adhere the corners of the green screen too. The green screen can also be setup in landscape or portrait orientation, so you have a little more headroom if standing while recording. Setup isn’t as fast as the Creator series, but still not bad for two minutes. Since it’s only 8.5 pounds, I am concerned, that the lightweight, aluminum and plastic tripod exoskeleton will eventually bend or even break with portable use, especially the locks that keep the screen in place. I imagine over time, they will wear out. On top of that, even though the screen is made from the same wrinkle resistant Chromaboost fabric as the Creator, users would be well advised to keep their screen rolled inside the shoulder bag when traveling or when not in use. Resist the urge to fold it. Cost of the Valera Explorer 90 is $129. It’s also available in a 70″ model for $99. And again, educators and students can sign up for a discount code, but use the 15% discount above. It’s a better deal. So, what are my thoughts on these two green screens? 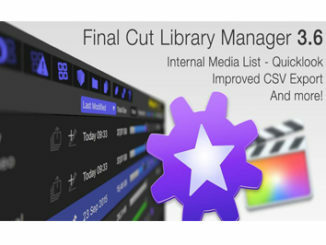 Well, Valera is sought to address a gap in a content creator’s arsenal by providing them with the tools to Chromakey on the fly, no matter where the creator is. Whether recording in a studio, or out on location, the Valera green screens fills that void nicely. But if you’re like me, and are very hard on your mobile gear, then spend the the extra cashand rely on the Creator series green screens for any portable applications you require. Star Rating: a solid 4 out of 5. It works great, but the disassembled arms are still too long for air travel. Been looking for an alternative and haven’t found one. I’m guessing the Explorer 90 is still too long. Need rods 28″ or shorter. You may want to look at the 70 inch model.